US scientists have developed a way to create super water-resistant metals. Lasers will create self-cleaning, anti-icing, anti-corrosion and anti-microbial surfaces, which could be used in solar panels and sanitation products. Scientists at the University of Rochester, New York, have used lasers to create surfaces that make water droplets bounce off with no temporary chemical coatings needed. This is the case with most modern water-repellent materials. The super-hydrophobic properties of modified metals were described in a paper, published on Tuesday in the Journal of Applied Physics. The team of Chunlei Guo and Anatoliy Vorobyev use femtosecond laser pulses that last on the surface for a quadrillionth of a second. 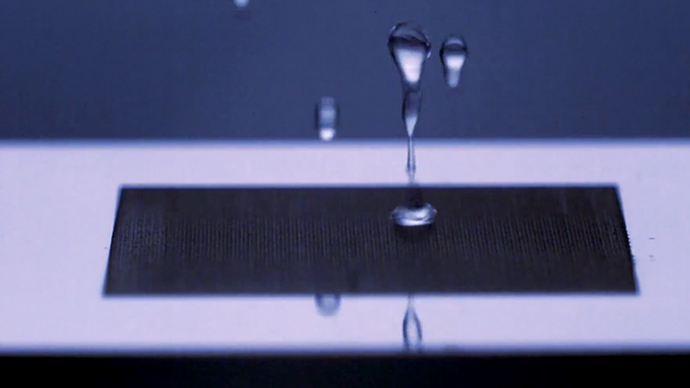 “The material is so strongly water-repellent, the water actually gets bounced off. Then it lands on the surface again, gets bounced off again, and then it will just roll off from the surface,”said Guo, a professor of optics. What makes the technology so unique is that it creates “an intricate pattern of micro-and-nano-scale structures,” which become “intrinsically part of the material surface” of such metals, as platinum, titanium, and brass. To test the materials’ property of self-cleaning (as water is able to collect dust particles), scientists spilled ordinary dust from a vacuum cleaner onto a transformed surface. Just three droplets of water managed to remove roughly half of the dust particles, and it took only a dozen drops to leave the surface completely spotless. However, the invention, funded by the Bill & Melinda Gates Foundation and the United States Air Force Office of Scientific Research, currently still faces some challenges. For instance, it takes an hour to pattern a 2.5 square cm (one inch by one inch) metal sample, which is not acceptable for large-scale production. The team is also looking at expanding this technique to other materials.